There’s a full and very reasonably priced menu available at Las Maretas, but you should definitely listen to the many specials from Domingo before making your choice. We ordered the local prawns from La Santa which were stunning! 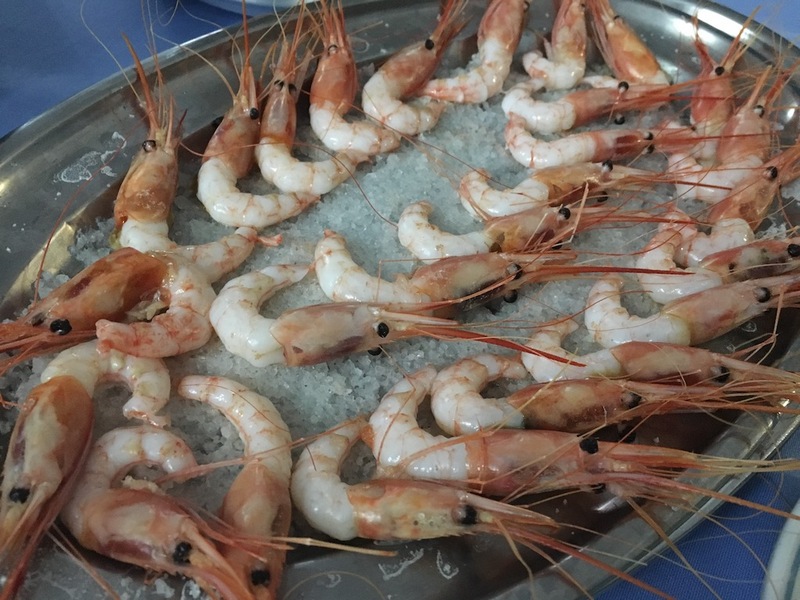 The prawns had been fully shelled, with just their heads left for decoration, they were served hot on a bed of sea salt. The prawns off the specials menu were deliciously juicy and sweet, highly recommended. It’s also a large portion, around 30 of them so good for sharing. There’s a great selection of fresh fish available at Las Maretas, as well as lobster and it’s all served filleted, so you don’t have to worry about bones. There were several white fish options in the specials including sole, cherne, sama and grouper which could be cooked any way you liked with a choice of sauces. I decided on a “strong fish from the deep” cooked a la plancha (grilled) with garlic. The fish was indeed a tasty white portion of fish with a healthy portion of toasted garlic on top, served with a portion of fries and salad. Mike ordered the beef stroganoff and was offered the choice of Uruguayan beef or Angus beef, he said the steak was delicious but for him the sauce was a bit bland. I really shouldn’t have ordered a dessert as I’m trying to be good, but I had heard about their baked alaska and I’m so glad I did! This is a show stopping dessert made for sharing, Domingo liberally ladled a spirit over the top of the meringue to flambé the pudding at the table. It was my first ever baked alaska and I loved the hot and cold combination of strawberry & vanilla ice cream and warm fluffy meringue. If you read the reviews for Restaurante Las Maretas in Costa Teguise, many refer to a long wait for food, so this isn’t a place to dine in a rush. Domingo runs the front of house on his own and his wife is in the kitchen, there are 14 tables hence the need for pre booking at busy times and having patience with service. We dined at 7.30pm and within 30 minutes the restaurant was full, however by 9pm there were several tables available for a second sitting. We were prepared for a wait but once the warm bread and the superb aioli dip arrived, the dishes flowed without any delay. We can see why this restaurant is popular with many loyal diners returning over the decades. Our three course meal with drinks and a tip was €40 per person. For reservations telephone 928 59 00 78. 5 star luxury Casa Carlara is located in the prestigious Faro Park community in Play Blanca and features air conditioning, private heated pool and is in a quiet cul de sac with an extensive plot.